aluminum instead. Iron is very rarely used by commercial fencing contractors, as we’ve developed alternatives that mirror the look of iron but are several times more durable and weather-resistant. With galvanized steel ornamental fencing, you’ll be able to create the aesthetic look of an iron fence without having to worry about rusting and corrosion, an inevitable outcome for a real iron fence. Galvanized steel is one of the strongest materials available for ornamental fencing, making it perfect for outlasting Minnesota storms. Particularly in one of our famous Minnesota hail storms, less sturdy materials could warp, bend, and even break with the force of record-breaking hail, but steel is made to be stronger than the average fencing material. Because steel fencing systems are coated using a multilayer coating system, they have the advantage of being doubly protected against the weather and corrosion. First hot-dipped and then coated with a polyester powder coat, galvanized steel ornamental fencing prevents premature rusting that could easily compromise the integrity and longevity of your fence. Because of this double layer of protection, steel ornamental fences require far less maintenance than other fencing materials that are more susceptible to weather damage. Unlike iron fencing, steel fencing panels are manufactured to be assembled using industrial grade rivets. Rivets connect pickets to rails, giving your fence the look of an authentic wrought iron fence without having to be welded, which increases the risk of corrosion. Steel fencing systems are often used on both residential and commercial properties because of its combination of aesthetic appeal and durable functionality. Whether you’re looking to create a traditional atmosphere at your home or business or simply want a durable fencing system that will keep your property as safe as possible, a steel fence is the perfect solution. On commercial properties, you’ll often see steel fencing systems in areas where customers or guests are encouraged to look through the fencing without having access to the other side. Because steel fencing creates a physical barrier only, and not a visual barrier, it’s a fencing system that can be used to allow outsiders to see your property, complementing your home’s design and showcasing elements of your business that might attract customers or guests. 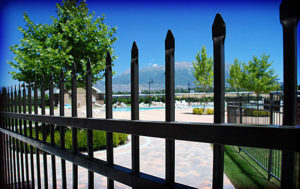 Steel fencing can be seen surrounding outdoor pools, closing off limited-access parking and restricted areas, and outlining entire properties to keep trespassers out and provide a more isolated area for everyone inside. As they’re modeled after the wrought iron fences of the olden days, steel fences are known for their intricate and varied designs, meant to create the “look” of iron without all of the drawbacks that accompany the rust-prone material. Steel fences can therefore be as simple or unique as you’d like, becoming an added design element for a traditional-style home or a simple, durable fencing system that will blend in with the rest of your property. Twin Cities Fence offers several galvanized steel fence styles, including picket fences with and without top rails, spear top and staggered spear top styles, and a variety of other finials and rings to create a distinctive and unique design for your fencing system. Whether you’re looking for a fence that’s difficult to climb, will add aesthetic value to your home, or will simply keep your home or business as secure as possible, a galvanized steel fencing system could be exactly what you need. 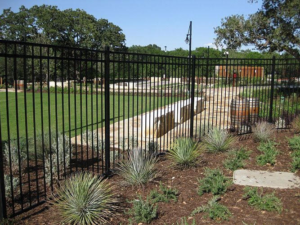 With an ornamental steel fence or a simple steel fence made for durability, you’ll find that your fence can fulfill any residential or commercial fencing needs you may have. To find out more about the benefits of galvanized steel fencing systems or for more information about our steel fence design options, contact Twin Cities Fence at 612-443-1948, or email us at contact@tcfmn.com.